pharmacy online canadian pharmacy Rojak | Penang Street Food | Penang Delicacies "penang food", "penang hawker food", "penang street food", "penang delicacies", "penang gourmet", "food in penang"
Rojak is the local fruit salad which consists of bite sized pieces of crunchy cucumber, pineapple, green mango, “Jambu Air” (Eugenia Javanica or Java Apple), turnip (jicama or yambean), bean sprouts, soybean puffs and fried dough fritters. The salad is dressed with an exotic mix of sugar, chilli, lime juice and “heh ko” or a dark brown, pungent, viscous prawn paste, which is the pièce de résistance. The dressing is a balance of sweet, spicy, tangy, savoury and piquant all at once. All ingredients are tossed thoroughly so that all the fruits are coated in the glossy brown dressing, and finally sprinkled with crushed peanuts and topped with crunchy crackers. 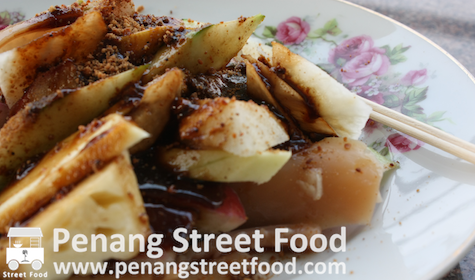 Penang Rojak is not to be confused with Indian Rojak or Pasembur also found in Penang. The main difference between Rojak and Pasembur is dressing which is a sweetish and spicy peanut sauce in Pasembur. This dish is representative of the multi-cultural mix in Malaysia. And as a colloquialism, the term “Rojak” means an eclectic mix! Rojak makes a great appetizer to a hawker meal and is an tasty, alternative means to enjoy the fresh local fruits found on the island. Prices range from RM3.00 for a small serving of Rojak to around RM10.00.